Some 23 million unskilled and semi-skilled labourers in the agricultural and industrial sectors are at risk of becoming unemployed once implementation of high technology and innovation in production hit their stride. The national police chief has said that the immigration process at airports must be faster and more efficient. A digital talent shortage, fewer digital products and uncertain policies have put Thailand near the bottom of the digital nation index, says a Singapore-based advisory firm. More business operators say they do not pay state officials in order to win a contract or a project, but the amount of under-the-table payoffs increases, said Assistant Professor Thanawat Pholvichai, director of Economic and Business Forecast Centre of Thai Chamber of Commerce University, on Thursday (Aug 10). CHILDREN ARE being trafficked to Thailand from neighbouring countries for underage labour, sexual exploitation and forced begging, a new report revealed yesterday. 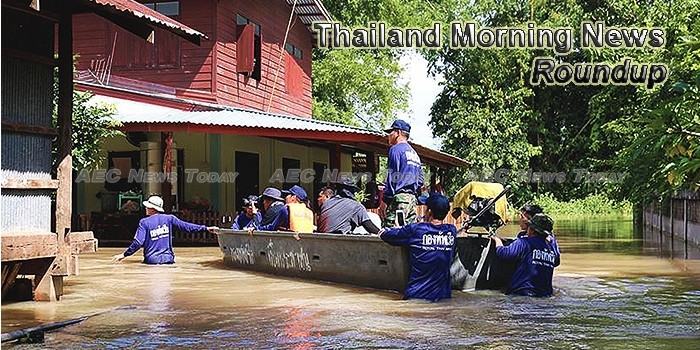 Residents in the eastern and southwestern regions of the country are advised to brace for heavy rains between August 11th-14th, while flooding persists in nine provinces. The Finance Ministry has deleted 2-3 million people from the lists of registered low-income earners because they failed to meet the requirements set by the Revenue Department, said Finance Minister Apisak Tantivorawongon Wednesday (Aug 9). His Majesty King Rama X has instructed a Privy Councilor to closely follow the management of the Chao Phraya Dam and a sluice gate under Chao Phraya River bank development projects, in preparation for possible flooding. A government-installed panel has rolled out an anti-human trafficking plan which corresponds with a United States recommendation given to Thailand in its latest Trafficking in Persons (TIP) report, authorities say. he Thailand-China Business Council has expressed confidence that the Eastern Economic Corridor (EEC) and China’s One Belt One Road strategy will contribute to no less than 0.5% economic growth in Thailand. The Isranews Agency has defended one of its reporters who was slapped with trespassing charge by the police when he entered an apartment building purportedly belonging to a former national police chief who is currently being investigated by the National Anti-Corruption Committee for being unusually rich. THE State Enterprise Policy Office (SEPO) has exceeded its target for budget contributions from state enterprises by 21 per cent for the first 10 months of the 2017 fiscal year. Public and private organizations have collaborated to establish the Industry Transformation Center for industries of the future. The center’s main task is to support the Thai business and industrial sectors to use advanced technology in line with the Thailand 4.0 policy. In today’s special feature we explore some of the Government development projects under the country’s reform roadmap with Na-ark Rojanasuvan. Sony Pictures Studio has launched a solely-owned affiliate film studio, Sony Pictures Entertainment in Thailand, in a bid to help generate higher income this year. Police have formally asked the public prosecution for the extradition of Red Bull heir Vorayuth “Boss” Yoovidhya to stand trial on hit-and-run charges which led to the death of a Thong Lor traffic policeman five years ago. The Public Health Minister has indicated that Section 44 of the 2014 interim constitution would significantly speed up the licensing of health-related products. Kasikornbank’s (KBank) corporate loan business will focus on syndicated loans to diversify risk as its corporate loan segment posted high single-digit growth in the first half. BANGKOK UNIVERSITY (BU) has denied reports that it is going to stop teaching journalism and says it is merging departments to meet the changing news-presentation landscape. THAI and Myanmar officials will sign a memorandum of agreement at a meeting of Asean energy ministers next month that will take energy giant PTT a step closer towards a major gas project across the border. The Immigration Bureau has pointed out that there has been a misunderstanding over news the Prime Minister signed the cancellation of the Immigration 6 card, explaining that the stoppage was to pave the way for a new form to be introduced in October. The Prime Minister has urged the public to cooperate with the government to turn flood-prone areas into “monkey cheek” water catchment areas, emphasizing the problem of flooding and drought. The Hajj Affairs Promotion Office of Thailand has disclosed that over 6,500 Thai pilgrims had arrived in Saudi Arabia.